I'm excited to share another Monday Motivation post from Nelida at Awaken to thrive. Nelida is a career coach who also offers Akashic records readings. She's graced us with her wisdom once before. Her latest article gives us clear advice on how to ensure we reach our goals in 2016. If you are like most people by the end of the year you are thinking about your goals for next year. There is great energetic opportunity in this season. Everyone has huge expectations around the new year. But a common mistake a lot of people do is to recycle last year's goals, checking off what was completed and adding a few more goals. I'm sorry to tell you that this method is not meant to succeed. You are just keeping the same energy that you had, while trying to manifest new things. You are contaminating 2016 with energy from 2015. Is no wonder why most people don't achieve their goals: they keep the same energy around the goals. I am going to invite you to do something different this year. Let's work on the energy and the foundation blocks. First I want you to think about a ritual to set around achieving your goals. Schedule some time on your calendar where you will have quite time alone. Take 5 minutes to do a small meditation and then start thinking about what you want for 2016. - What feeling comes to your heart? - How do you want to experience in 2016? - What you see yourself doing? Next, think about a friend you can meet with to discuss your goals. Think carefully about this person. It has to be someone whose energy you like, someone whose energy is not covered up with fear and doubts. Talking with someone about your goals is going to create more energy around it, it's going to feel more real. Now I want you to take time to think about the reasons why you didn't achieve a particular goal last year. Let's say you notice that you didn't have the time to focus on our goals. Write it down. Then repeat this process for any other goals you didn't achieve. If time appears to be a common denominator, you should think about defining "time management" as a top priority goal for next year. Once you identify your top priority goals, you can now create rituals that address your time management. If you notice that you didn't achieve certain goals because "I didn't have the money", then focus on learning about financial management. Invest your time in learning how to be the boss of your money. Don't let the money control your life, you should be controlling your money. Take time to analyze the patterns of behavior you have around money. See how money flows out of your life, pay attention to it. Monitor your money and then create new habits around how you spend it. Another big goal that a lot of people fail to achieve is regarding weight management. In this very sensitive topic, I invite you to take a look on how you feel about food. - What are your patterns of thinking every time you think about food? - What is the nature of your relationship with food? - How much control do you have over your health habits? - What does food mean to you and how can you alter that meaning? 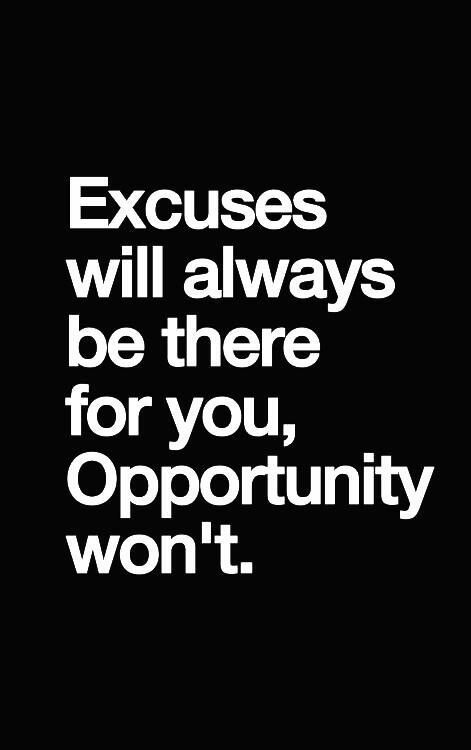 Is time to stop making excuses. How you eat today is the best approach on how you are going to eat tomorrow. Focus on taking care of yourself. When you solve these foundational issues you will be able to unblock the goals you didn't achieve because of these excuses. Eliminate the excuse! Your brain is a beautiful and powerful machine, and one of the best things it can do is convince you that your excuses are real. If you look beyond your surface levels excuses you will just realize that your excuses are a reflex produced in the brain, just to make you feel better! Yesterday I was at my cousin's house, and he was talking about how messy his work table and his home office was, "I don't have time to organize it" he said. Although we both know that it makes him feel more comfortable to have this excuse, he knows that is not true. If he wanted it badly enough he would find 5 minutes each day to clean just a little. Take responsibility for your life and your goals. Don't let life escape thru your fingers because you have too many excuses. - What would you do if you had no excuses? - What would you do to make sure you achieve all of your goals? Make 2016 the no excuse Year! I'm grateful to Nelida for sharing her insight with us. I love the idea of seeking out root cause issues for not reaching our desired outcomes. Once we get to the source of the issue, we can address it in a powerful way. I also co-sign on the idea of working with a friend to discuss your future goals. I've implemented this ritual for several years now and I can't tell you how well it works for creating laser like focus on your goals. Nelida and I have discussed our intentions at length and it's a blessing to have someone to listen, cheer me on, and challenge my strategies. If you want to connect with Nelida for additional clarity, you can visit her website here.